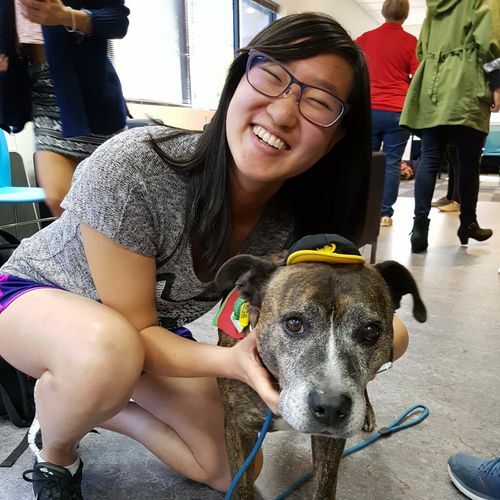 More than 180 first and second-year Doctor of Veterinary Medicine (DVM) students took a welcome opportunity to unwind, relax and enjoy canine companionship as part of the 2018 University Mental Health Day. The Day aims to highlight the importance of both looking after mental health at university, and supporting fellow students and staff. Students with Kobe the golden retriever and Remy the poodle. Photo: Aaron Hughes. The theme in 2018 was "CommUNIty," promoting strong ties within the community that supports the wellbeing of individuals. Faculties across the University of Melbourne scheduled a variety of fun and informative events to celebrate the Day. The Student Experience team in the Melbourne Veterinary School was excited to host an event for Parkville-based DVM students. 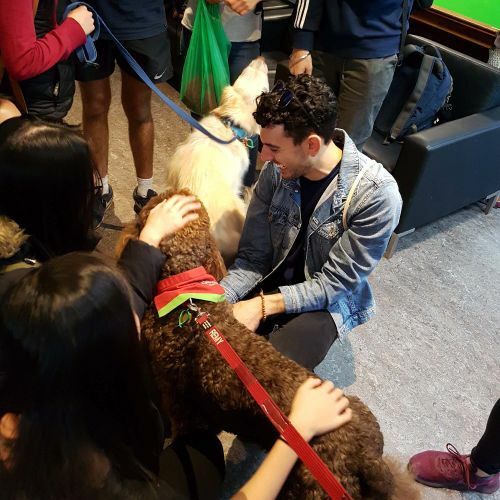 Students were treated to a visit from the Delta Therapy Dogs, a program that aims to support in the form of animal companionship to the community. All dogs and handlers in the program are accredited by Delta Society, a not-for-profit organisation which focuses on the value of human-animal bonds. Five therapy dogs and their handlers visited on the day: Kobe, a golden retriever, with her owner, Melissa; Bella, a kavoodle, with her owner, Mandy; Remy, a standard poodle, with his owner, Luke; Petey, a Staffy cross, with his owner, Liz; and Kelsey, a kelpie, with her owner, Darren. Melissa herself is a second-year DVM student at the University. Kobe and her owner Melissa, a second-year DVM student. Photo: Aaron Hughes. Students had the opportunity to spend an hour and a half patting and playing with the dogs while chatting with their handlers. 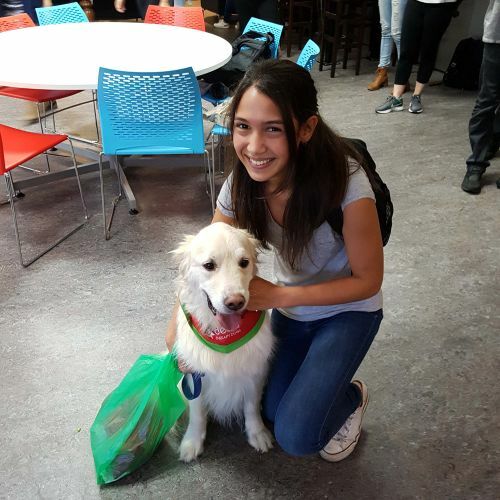 All of the dogs revelled in the attention from students, often with three or four students at a time giving each of the dogs belly rubs and head scratches. Their unique personalities were a highlight, and ensured they all received attention from students. University Mental Health Day also included a delicious lunch on the day from well-known campus pizzeria Pronto Pizza. Students also received double coffee vouchers, encouraging them to take a friend out for a chat over a coffee at campus favourite Dr Dax Kitchen. Staff said they were very grateful to the Delta dog owners, all of whom volunteer their time and dogs as part of the therapy-dog program. The event for University Mental Health Day is one of a number of initiatives run by the Student Experience team, designed to provide opportunities to support and engage students studying in the DVM. Feedback from students has been extremely encouraging, with talk already of a return visit from Delta in Semester 2! Story and photos by Aaron Hughes, Melbourne Veterinary School. Banner image: Kobe and students. Petey, a Staffy cross, and a student. Photo: Aaron Hughes.